Like many brands, LG has suffered in the tablet PC market in recent times – data from the 2nd quarter of 2015 had them on 3.6 per cent of global market share, behind Apple (24.5%), Samsung (17%) and Lenovo (5.7%). Squeezed between Apple and Samsung at the high end of the market and cheap Chinese devices at the low end, LG is one of many to struggle. Turnover in LG’s mobile section (which includes their tablet sales) was stagnant, and operating profit was slashed. So in defense of their position, LG recently announced two new tablets – an 8-inch update to its 2013 G-Pad, and a 10.1 inch option. We had a play with the 8-inch version. First and foremost, the device looks very much like the older version – it’s designed vertically, meaning headphone jacks are not on the bottom (an irritant to many). The G Pad II (model code LGV498) comes with a stylus, full-size USB port (which we love, though it’s only USB 2.0), and a MicroSD slot (up to 128GB). The stylus is impressively narrow, indicating some design thought has gone into making Android recognise it (it wouldn’t normally allow input from such a small touch). Overall, the build quality is good but not great, and there’s little wow factor. It runs Android 5.0 (Lollipop), and has an okay processor – a 1.2 GHz Snapdragon quad core. The device weighs 12.31 oz (just under 350 grams) which isn’t especially light. When you’ve held some of the premium versions for a while, this one starts to feel like a 1980s cellphone. An unfair comparison, of course, because it’s priced very differently from the elite tablets. Still, we’d like to have our cake and eat it. The display is 1280×800 at 189 pixels per inch. While the trend seems to be towards a 4:3 aspect ratio, LG is doggedly sticking with 16:9. It measures 8.30″ x 4.89″ x 0.35″. The battery is on the small side – 4,200 mAh, though it gives 9 or 10 hours of real-world use. The cameras are not an issue – a 5MP rear camera will take an okay photo, and the 2MP front lens is plenty good enough for some Skyping. Microsoft Office comes pre-installed and there’s 100GB of free cloud storage for two years. A much-needed special feature comes in the form of the QSlide Function – it lets you split the screen into two and resize either window. It’s multitasking, on an Android… for selected applications. Q Pair 2.0 allows you to pair the device with your Android phone and use the tablet to take calls and respond to texts. 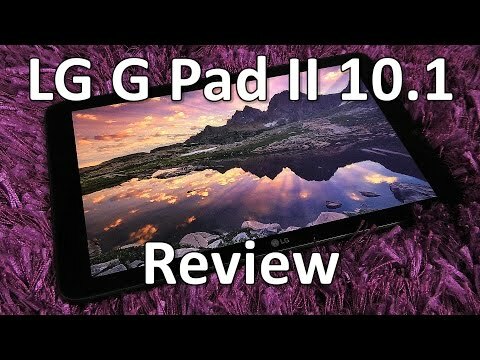 LG G Pad II 10.1 Review – dated specs, so what? The LG G Pad II 8 inch offers no new features, and seems unimaginative compared to other tablets released recently. However, not every tablet will change the world, it is a worthy, solid device that will allow those who buy it to do some light office tasks on the go. Released at under 200 dollars, it will go some way to helping LG retain its market share, though I’d be surprised if it was a huge hit in North America.